Akamai enunciated ‘ah-ka-my’ is Hawaiian for Intelligent , Sharp and Speedy. 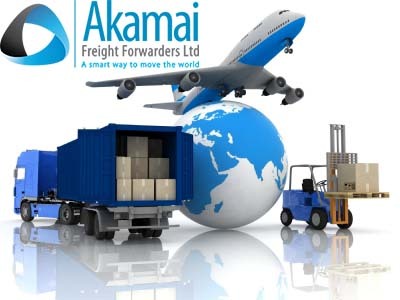 Akamai Freight Forwarders Ltd is a licensed customs agent that was incorporated in 2010. Our prime objective is to offer efficient and timely back to back logistic solutions to Importers and Exporters so that they can keep up the pace in the face of globalization and E-commerce. Akamai Freight Forwarders provides all the necessary links required to effectively and efficiently manage logistic costs. We are a Clearing and Forwarding Customs agent that delivers superb import and export services every time by air, road and sea. Client guidance and compliance responsibilities in line with the Government of Kenya, Kenya Revenue Authority and Kenya Ports Authority provisions. Liason with vendors for all third party activities. Akamai Freight Forwarders continues to grow ever day thanks to the confidence our clients have in us. Jumuia Place 1 Lenana Road, Lower Ground Floor. Mombasa Uni Plaza, 6th Floor Aga Khan Road.